Adam Piontek 3e2ac792d4 including microblog support, still needs generalization for config support. copyright text changed to image for Creative Commons BY-NC-ND 4.0 license --- you’ll want to change that at the bottom of layouts/partials/sidebar.html if you want a different license. 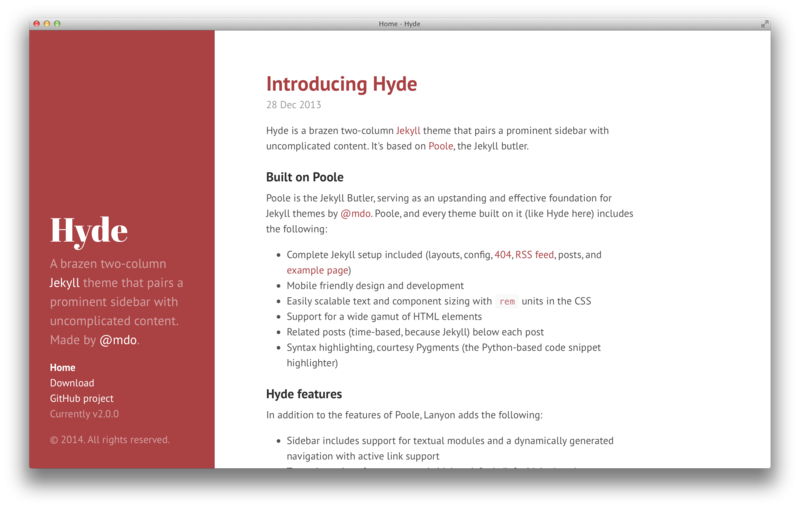 Hyde includes some customizable options, typically applied via classes on the <body> element. I converted all the tomorrow* themes from pygments, following parsiya’s instructions (also here). To use a built-in chroma style, remove pygmentsUseClasses and set pygmentsStyle to one of the built-in styles. faName is the name of the fontawesome icon you want to use. url is where you want the link to go. Either the corresponding social profile, or maybe for an rss button, “/index.xml” like I use. Create a list of nav links in the sidebar by assigning “menu=main” in the front matter. 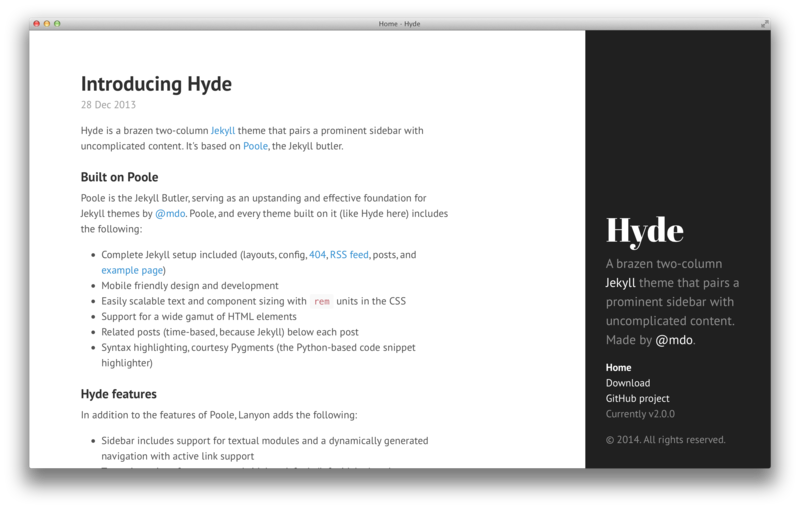 By default Hyde ships with a sidebar that affixes it’s content to the bottom of the sidebar. You can optionally disabled this by removing the .sidebar-sticky class from the sidebar’s .container. Sidebar content will then normally flow from top to bottom. Hyde ships with eight optional themes based on the base16 color scheme. Apply a theme to change the color scheme (mostly applies to sidebar and links). There are eight themes available at this time. To create your own theme, look to the Themes section of included CSS file. Copy any existing theme (they’re only a few lines of CSS), rename it, and change the provided colors. You can optionally enable a comment system powered by Disqus for the posts. Simply add the variable disqusShortname to your config file. Note: Previous version 1.0 the Disqus shortname had to be defined inside the [params] block. googleAnalytics = "Your tracking code"